Embark on an 8-day journey that immerses you in the wonders of the Galapagos, making this a truly memorable vacation. There are many close encounters with the exotic and curious creatures that love to interact with people and make the daily excursions an exceptional experience. 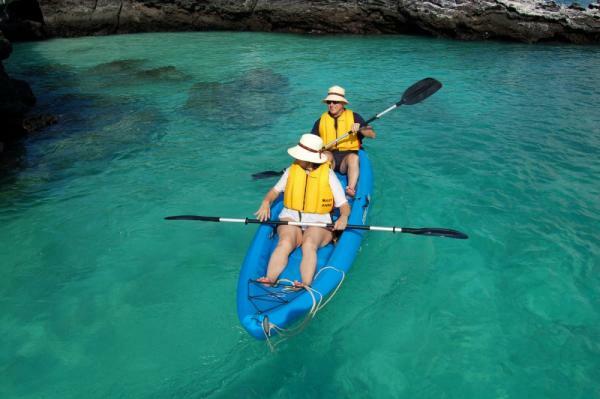 Enjoy snorkeling, swimming, and kayaking in the pristine crystalline waters of this incredible area. Indulge your senses and bask in the beauty that surrounds while on vacation in the incredible Galapagos. Arrive at the airport in San Cristobal and transfer to the Evolution. After lunch, sail to Leon Dormindo, an amazing rock formation that rises 500 feet out of the ocean. Then celebrate your first equatorial sunset with a welcome cocktail, followed by a delicious dinner. Travel to South Plaza, a small island covered in Opuntia cacti. 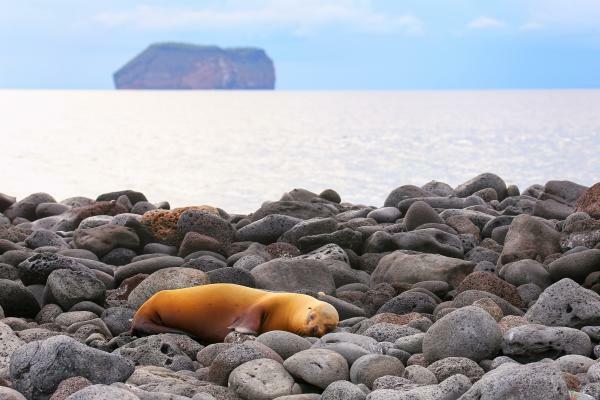 The island is home to one of the largest sea lion colonies in the Galapagos archipelago and also features many colorful yellow and red land iguanas. Take a brief hike over the terrain for views of the island. Spend the early afternoon of excellent snorkeling at Punta Carrion, followed by a excursion to Mosquera Islet. 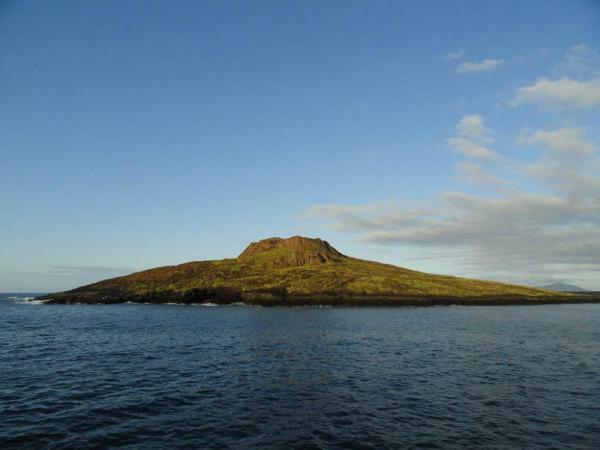 On Mosquera, you may see one of the largest sea lion colonies in the Galapagos and possibly an orca whale! Journey on to Chinese Hat. This island derived its name from its distinctly conical shape. 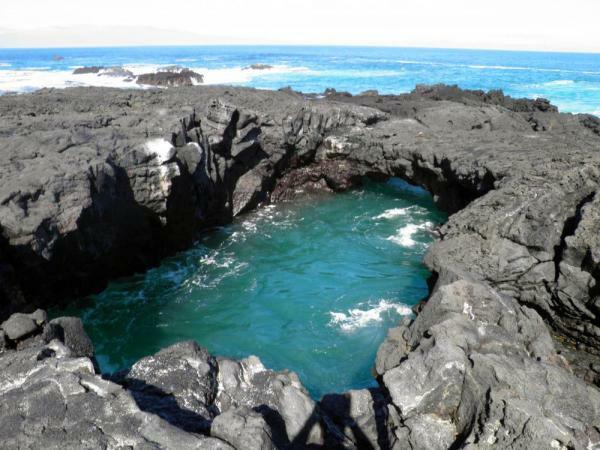 Chinese Hat is an ideal destination for viewing volcanic formations, such as lava tubes and flows, and is also home to sea lions, marine iguanas, and Galapagos penguins. Then head to James Bay in Santiago. Walk along a black beach and snorkel with tropical fish and sea turtles in the Bay's crystal clear waters. On shore, you may choose to walk on a trail that leads to a series of crystal-clear grottos full of sea lions, fur seals, and samurai-like marine iguanas. You may even spot a Galapagos hawk! Set sail for Darwin Bay and land on its sandy white coral beach. 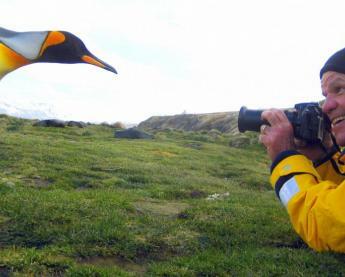 Hike a half-mile trail through the mangroves and view Nazca boobies, red-footed boobies, and swallow-tailed gulls. Tidal pools are teeming with young sea lions and reef fish, and the occasional hammerhead shark can be found among the rocks. Snorkel in the water before heading to El Barranco, also known as Prince Phillip's Steps. Hike up the steep rocky face to the top of a cliff where you can see red-footed boobies, short-eared lava owls, Galapagos swallows, and Galapagos doves. Sail for North Seymour Island to view Galapagos sea lions, blue-footed boobies, and magnificent frigatebirds. Characterized by its arid vegetation zone, North Seymour is unique in landscape and in feeling. After lunch, sail to Santa Fe Island, where you may explore one of the most beautiful and sheltered bays in the Galapagos, which is excellent for snorkeling! 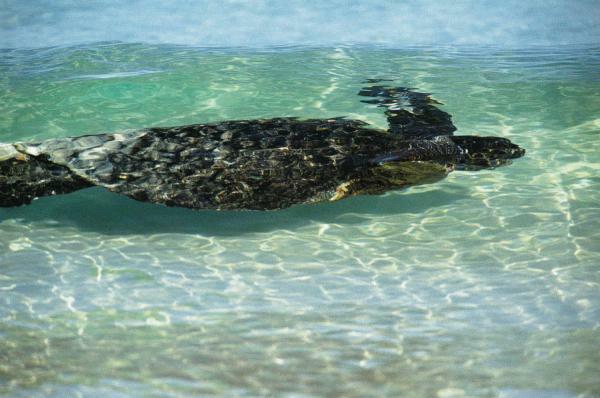 Santa Fe is one of the best places to find sea turtles, sea lions, and the Galapagos white-tipped shark. Then head to shore and walk up a nearby cliff to observe land iguanas through an area of Opuntia cacti. Spend today on the historical Floreana Island. Start the day in Post Office Bay, where British whalers set up a barrel as the island's Post Office. The tradition continues today, and you could even send a postcard home! In the afternoon, visit Punta Cormorant, where you can visit two unique and highly contrasting beaches. One is a green-colored olivine beach, and the other an iron-red beach. 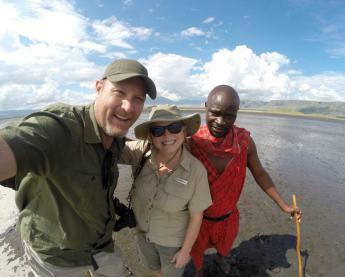 In between the two beaches lies a salt lagoon that is frequented by flamingos, stilts, pintails, and other wading birds. In the late afternoon, head to Devil's Crown for some phenomenal snorkeling. This region is home to a variety of coral, wrasses, pencil sea urchins, amberjacks, angelfish, and many other species. In the morning, sail for Santa Cruz and begin your day with a tour of the highlands. The trail passes through a number of distinct vegetative zones, affording explorers with lovely views of Santa Cruz's lush, rolling hills. In the afternoon, tour the Charles Darwin Research Station and view the tortoises in various stages of life. Newly hatched tortoises average 3 inches long, while the adults can reach over 4 feet. Stretch out your hand and interact with these gentle giants. Spend the morning in Black Turtle Cove, a gorgeous mangrove estuary. Take a panga ride and search for spotted eagle rays, white-tipped reef sharks, diamond-shaped mustard rays, Pacific green sea turtles, and many different shore birds. After this last excursion, transfer to the airport for your connecting flight to the mainland. Named for Darwin's famous theory, the Evolution is a comfortable motor yacht ideal for families or travelers hoping to get in some diving on their Galapagos vacation. The itineraries focus on the natural experience and give you engaging ways to experience what the Islands' first explorers did centuries ago. Located on the Darwin Deck, 4 ample deluxe staterooms (twin and double) and port-holes. Located on the Cormorant Deck, premium stateroom. Located on the Cormorant Deck, 8 premium staterooms (twin and double) with portholes. Located on the Albatross Deck, 2 Master Suite with ocean-view windows. Located on the Albatross Deck, twin suite with ocean-view windows. 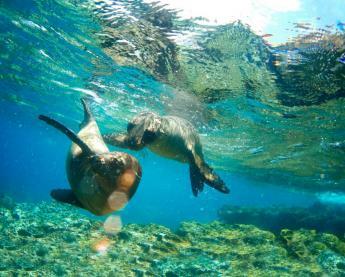 15% discount for children under age 15 at time of Galapagos cruise. Not valid for holiday departure dates. 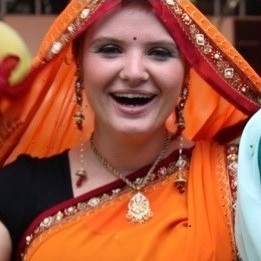 Initial deposit is $700 per person, and most travelers will call our office and pay the deposit with a credit card. Alternatively, you can register online here.